Heeling Our World is a project which impacts and improves the lives of children both in the U.S. and in Africa. It addresses the issue of the 300 million barefoot children around the world who are at risk of disease and death due to lack of footwear. In the U.S. our project raises awareness among students and gives them a pathway to advocacy. We work with both middle school and high school students. 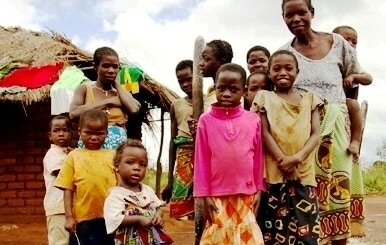 ​In Africa it applies the Millennium Development Goals (MDGs) adopted by the UN General Assembly. Our model establishes sustainable cottage industries for shoe making in rural villages. Our project gives mothers and caretakers the ability to make shoes for their children. It is a simple design called KLEM, made from locally sourced materials. When the youngster outgrows the shoe, it is an easy task to make a new pair. We have field tested the project in Mozambique with stunning results and are currently working in Uganda, Mali and Sierra Leone. ​In the U.S. our project teaches students that they are all “global citizens” and have the ability to impact the lives of their brothers and sisters around the world. After learning about the plight of the barefoot children, each student makes a pair of KLEMs, similar to those being made in Africa. For many American students participation in this project will become their first step on a lifelong journey as agents of change and the beginning of their empowerment as a force for social justice.